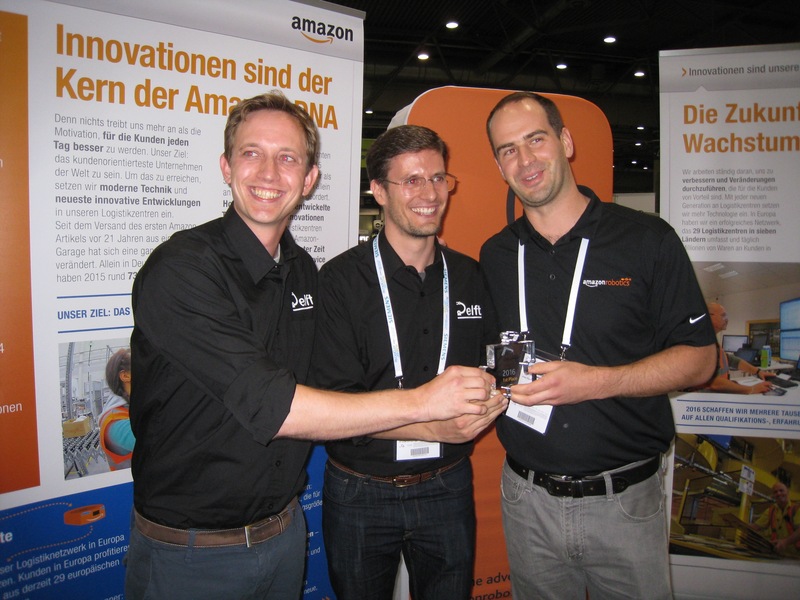 A team of engineers from Delft has won the Amazon Picking Challenge. Team Delft won the two separate picking and stowing finals, making them a double champion. The Amazon Picking Challenge 2016 was held during RoboCup 2016, the famous international robot competition which is held from 29 June to 3 July in Leipzig. During this challenge, robots autonomously retrieved a wide range of products from a container and put them on the shelves. The challenge is divided into two separate finals: yesterday the robots, equipped with grippers, had to autonomously retrieve a wide range of products from a container and put them on the shelves (the ‘stow task’). Today, it was the other way around and the robot had to retrieve items from the shelves and put them in a container (the ‘pick task’). To get the job done, the robot needs to deal with unsolved problems for automation: handling variety and operating in an unstructured environment. Team Delft won the stow task finals by collecting 214 points. Second came NimbRo Picking (186 points) and the team from MIT ended third (164 points). The pick task finals proved to be nerve wracking. Both Team Delft and the Japanese team PFN collected 105 points. What followed was a ‘photo finish’, whereby the jury analysed the first pick of the two teams. The faster team would win. With a difference of about half a minute, that proved to be Team Delft! NimbRo Picking ended third. 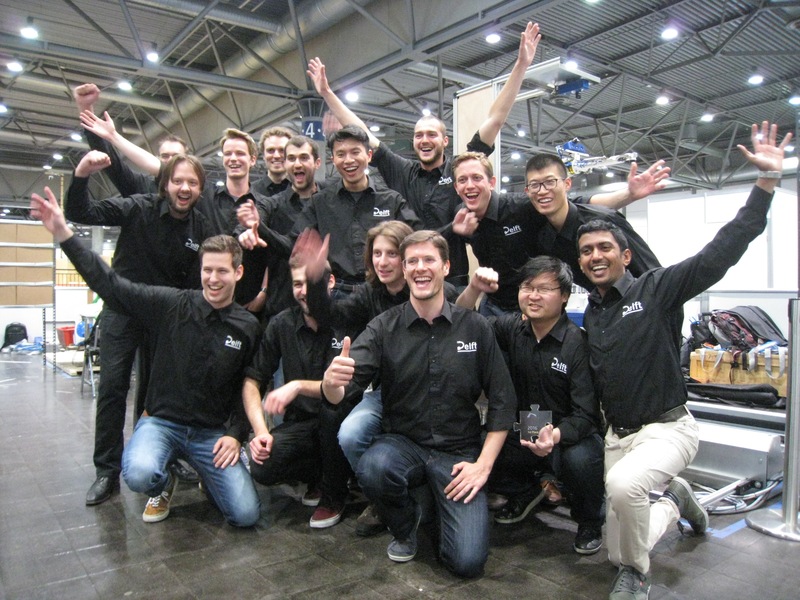 Kanter van Deurzen from the company Delft Robotics is one of the team leaders. His team won because of a thorough preparation, he says. “We have built a very robust system, that hardly makes mistakes when picking items” Also, the robot is programmed in a way that it chooses to go for the maximum amount of points that can be achieved. Team Delft was one of 16 finalists for the Amazon Picking Challenge, and is a collaboration between TU Delft Robotics Institute and the company Delft Robotics. The team built a flexible robot system based on industry standards. The system is equipped with a robot arm with seven degrees of freedom, high-quality 3D cameras and an in-house developed gripper. To control the robot, the team integrated advanced software components based on state of the art artificial intelligent techniques and robotics. The components are developed with the Robot Operating System for industry (ROS-Industrial), and will be released as open software. “One of the special things about the Delft system is the collaboration between a university and a market player,” Corbato states. “We complement each other very well.” Therefore, Team Delft is also supported by RoboValley. For an overview of the technical details of the robot arm and the difficulties Team Delft encountered, read the interview Hernandez gave to Factory in a Day, which supported the team as well. Factory in a Day is an European project aimed at improving the competitiveness of European manufacturing SMEs by removing the primary obstacle for robot automation: installation time and installation cost.